There is always a sense of satisfaction when we finally see our children reading, especially when they have been deemed reluctant readers. The phrase that is most often heard, “Well, at least they are reading!” Granted, a milestone has been reached. This cannot be underestimated or relegated to a natural stepping stone that would have ultimately occurred. The difficult truth remains that if a student is not encouraged or driven to read, the process can be markedly protracted with episodes of stagnation and loss of competency with the development of literacy and comprehension. Thus, while there is much to celebrate when a reluctant reader begins to find an interest in reading, which is akin to the germination of a seed. If one wishes a child to flourish and bloom (to use an overstated, and frankly, syrupy term) that initial spark needs to be stoked, so that a competent student can be forged. The question remains, how then do we progress our children beyond that initial “Big Bang” effect? At the heart of the issue is a required acceptance that reading is a long-term temporal construct that requires all stakeholders to recognize that while short-term solutions may affect change (tutoring, differentiated instruction, moments of intervention, and academic accommodations) the genuine drive to move forward rests in the frequency and consistency of the aforementioned short-term solutions acting in concert with each other inside, and perhaps more importantly, outside of the course and classroom experience. Much like the broad consensus regarding student success: an interested and active parent in education equals high performance; so too, the same active and interventionist oversight is required. Ultimately, our children should be able to gain the techniques required to see and interpret the world behind the book. To take hold of a text and deconstruct it, based on a set of criteria inherent to their ability to read and evaluate/synthesise material. As a laudable goal, this is undoubtedly the end game. The items listed below are the bridges across that great gulf from first contact to mastery. Be warned, be cautious, and be patient, the transference of literacy to a level beyond cursory entertainment-based reading does work in tandem with the passing of time, the development of scholastic skills, and something that cannot be disregarded, the evolution of personality, maturity and life experience that ebbs and flows along an intersecting continuum, not a straight line. Perhaps the former is the factor which most acts as a governor switch on the development of literacy. Parents may wish to begin with a text that is highly illustrated, but short on words. This works extremely well with many of the classics. Take for instance Robert Louis Stevenson’s Treasure Island. One can purchase the Dover Thrift Edition which is largely text-based and not a good transference point for the reluctant reader. However, with the Sterling Illustrated Classic’s version, one reviewer was spot on in his assessment: “A great book to introduce classics to young readers. Robert Ingpen’s illustrations greatly assist young readers in understanding this classic of 19th century literature. There are 70 brilliant watercolor illustrations appropriately scattered throughout the book which greatly assist young readers in following the story line.” Many male readers need a visualization of what is occurring in the text to make it “real” for themselves. These visual cues and chunked information make a difference in their approach to the text. Don’t be afraid to begin with versions that are geared to a much younger reader and quickly progress up the line. Building the exoskeleton of meaning and then later giving meat to the bones is a valid and successful approach. One of the most daunting texts a student will come across is any work by William Shakespeare. The reluctant reader will almost immediately throw up a road block to the Bard because the language of Elizabethan England proved to be too befuddling when it came to comprehending the story. If ever there was a tome of writing that required illustration it is certainly Shakespeare. The graphic novels are certainly available to guide one through these iconic tales. They are most certainly not the condensed, serialized format of the comic book, but rather longer and illustrated treatments. Where do we go after the graphic novel? Two of the best guides for Shakespeare are the Lois Burdett series Shakespeare Can be Fun and the Spark Notes series, The No Fear Shakespeare. Burdett fashions such classics as Hamlet and Macbeth in modern English, but selects critical quotes from both works to guide the reader. Illustrations by the students who actually worked with Burdett are found throughout the books and make for both an entertaining read, but also help to refocus the reader. The drawings also convey the message, “If I can do it, so can you.” Acting out scenes with my Grade 5 class came easy, because the text lends itself to doing that. I read Burdett’s version of Macbeth with my Grade 8 class, before tackling a more comprehensive text. The Spark Notes series, The No Fear Shakespeare, is not structured like the abridged “Coles or Cliff Notes” format, which may come to mind based on the name of the publisher. Nothing untoward against the C and C format, but that type of textual assistance should be a last resort, if not a finishing tool, after the proper avenues of learning have been utilized. However, they are brilliant at providing charts identifying the aliases which Shakespeare’s characters have. It is still critical that the readers, even of daunting text, experience and frame the narrative for themselves. The No Fear Shakespeare has a simple, yet highly effective methodology: Elizabethan English on the left, and modern English on the right, line-for-line. With plenty of discussion and role playing lessons, Shakespeare becomes quite enjoyable and a favourite amongst students. Level A: A re-write of an Act or Scene, based on another character’s point-of-view. Level B: The writing of another act or alternate conclusion. Level C: Playing the character from the scene with original dialogue. Reading in the Fourth Dimension. There exists a marvelous adaptation of Level D in, what else, but a graphic novel! Enter Kill Shakespeare! Having met the creators/writers of this body of work at the 2012 Toronto Comic Con, the wit and intelligence of Conor McCreery, Anthony Del Col and Andy Belanger certainly come through on the pages of their graphic novel series. However, it is not another treatment of Shakespeare via the aforementioned methods, but truly an example of high order comprehension and metacognition taken to its limits. For the uninitiated, the characters of many Shakespearean works now exist in one universe, acting together and forging new relationships and motivations from jumping off points of recognition with implicit and subtle references to the original text, but also exercising a sense of literal free will or desire for literal free will against their creator, Shakespeare himself. More I shall not say it is definitely worth the read. However, this graphic novel does not function like the typical comic book or graphic novel in the reluctant reader sequence of comprehension development, rather than complete a hermeneutic circle of meaning it creates, if you will, a double helix hermeneutic continuum, which vaults the reader into an even deeper level of metacognition, even more complex than Reading in the Fourth Dimension. 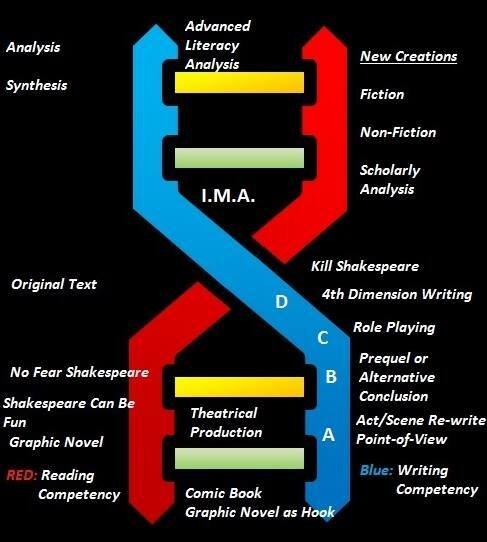 It is perhaps the conduit required before reading non-fictional literary analysis of Shakespearean text. Always encourage reading. Don’t be mortified if your son is bringing home some of the “giants” of the elementary literacy world, like Captain Underpants, Bone, and Diary of a Whimpy Kid; these titles are just fine, but should not be the sole source of reading material. Think of reading like exercising at a fitness club. There are some people who just sign up for the gym and go all out: they lift a ton of weights, and are never seen again because of a massive muscle strain or lack of pacing. Literacy is just the same. What a child reads is often levelled. There will be books below, at, and above their capacity and skill sets. While they will breeze through some light titles, they will want to read books with more substance, as well. This is the mind in training. I will often see students walking out of our library with one of the Lord of the Rings trilogy with a most determined look on their face. The majority of these students will read through some of the chapters, and then put the book down for a long time. However, they will revisit it, perhaps not during the current academic year, but they will come back to it. This is the perfect time for a parent or teacher to intervene and suggest some shorter titles that are still within the ability of the reader. Educators and parents often struggle with this very open-ended question, “What type of things do you like to read about?” Your typical male elementary school student will reply: “I don’t know, aliens, action, cars, mystery, things like that.” The spectre of frustration might begin to raise its head. However, try digging deeper. Ask what specific books your children liked that they have read. Then try to discern some overall theme that these books possess. Avoid specificity with that process. Look for themes such as the following: courage, teamwork, good vs. evil, struggle, mystery, survival, and discovery. It is guaranteed that at least one of these themes exists in your child’s reading experience. Then begin to source some books with these themes. This process will also work if the child is interested in a particular subject, geographical location, point in history, technological item, or dynamic product. As an example, my Grade 3 class read a brilliant book called Varjak Paw. It is about a young cat that must go out into the dangerous underground world of cats in New York City in order to help his family that is being kept prisoner. The book is filled with the aforementioned themes, very light on illustration, heavier in text, but rich in thematic connections and points of interest for reluctant readers who seek action and a swift moving plot. Readers will want to act out parts of the book, develop posters, and perhaps even comic strips, based on a chapter or two. One of the keys to accelerated reading and writing prowess lies in these mid-range texts that engage the reader in fewer than 300 pages. There is something inherent in being able to hold a book and immediately go back to verify the information of text on previous pages. Whether this occurs with the traditional printed text or in digital format is currently under some debate. However, the fact remains that memory and connection play a key role in developing one’s ability to read, connect, analyze, and synthesize. The comic book and graphic novel have a splendid manner in introducing such a skill set in a rather implicit in innocuous way. The readers can go back to any plot point and instantly refresh their short-term memory with a vivid image married to text. With the world becoming very media/visually literate, someone who is learning English or a reluctant reader/writer could use the comic book as a means of engaging a sense of prediction and revision at the same time, by following sequential design, yet being able to visually flip back and restore the immediate visual hit again and again. This informed memory access (I.M.A.) and renewal is at the heart of the means to learn English in its colloquial and contextual element, while discerning the culture from which it had been derived in a parallel process to the native English speaker, defining the world of the comic book, which for the ESL/ELL learner includes the new world of his country. Once the reluctant readers have strengthened their I.M.A. they can proceed to heavier text-driven narratives and use this competency bequeathed to them by comic books to become a stronger reader. To think of learning to read as linear progression of ability would not be entirely correct. On the surface, reading appears as a maturation process. While persons might begin with simple picture books with no text, and progress to novella, and further to what is deemed higher order literacy, that progression, while appearing linear, should not be assessed as being such a “given” in human development. Reading does evolve through time, yet the faculty for reading above a rudimentary and cursory level is dependent upon the quality of the intervention and management of texts, and their deconstruction occurs from outside influences. Thus, if a student was left to their own devices and continuously handed texts, their development and skill sets regarding literacy may not develop on a linear scale of positive progression. In short, they might stall, stop and, worst of all, cease reading as it has become too cumbersome and difficult to progress to weightier texts. Proficiency and enthusiasm can be revived through the techniques and strategies posited in this article. Never let it be said that this revival can engage a variety of texts and go below and beyond a reader’s current ability. While we all want our children to read beyond the comic book and graphic level, we cannot sweep these texts aside while we pursue what we feel are higher classics and literary treatments. Literacy is not a continuum existing on a straight line, but rather a double helix, twisting and turning through time, revisiting and renewing old competencies while striving to enter new gateways to the future. Fascinatingly, the framing of comic books and graphic novels as a jumping- off point to literacy is a correct assumption; however, the genre seems to reinvent itself and reoccur offering new aptitudes and proficiencies at gateways of development along the double helix continuum of literacy. This entry was posted in Comics For Kids, General News by Kevin A. Boyd. Bookmark the permalink.